Then someone introduced me to roasted beets. I can’t even remember when it was or where it was. But I am a changed woman. Unfortunately, not everyone has come around to my point of view. Even my normally adventurous niece and nephew turned up their nose at a beet and potato salad. I thought for sure I could sell a pink salad to a five year old girl! Maybe I should have told them about how it can change the color of your pee. Tough crowd. 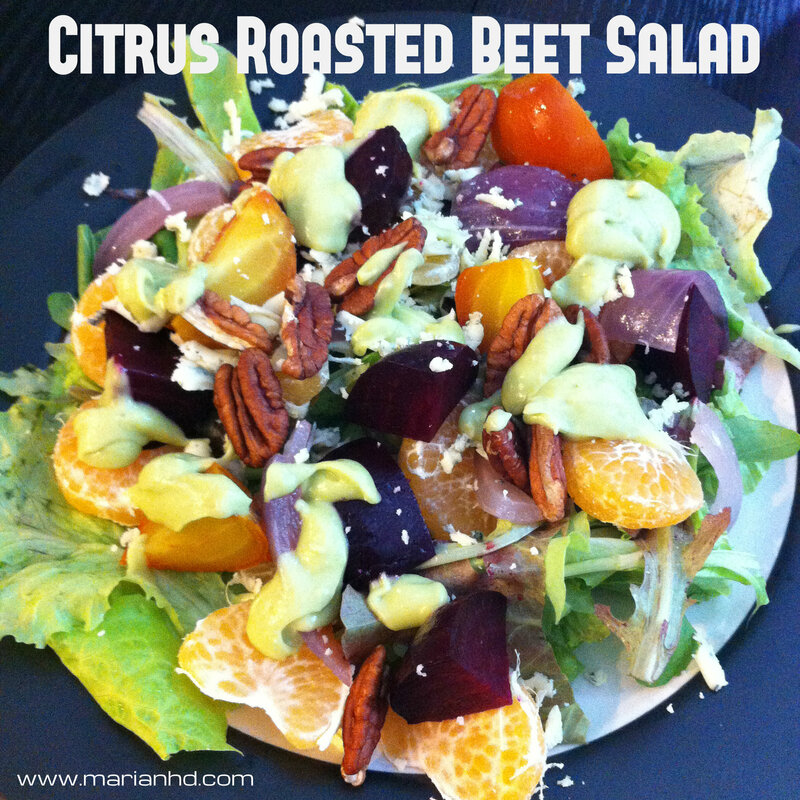 The general disdain for beets made it difficult for me to find an inspiration recipe for this salad! 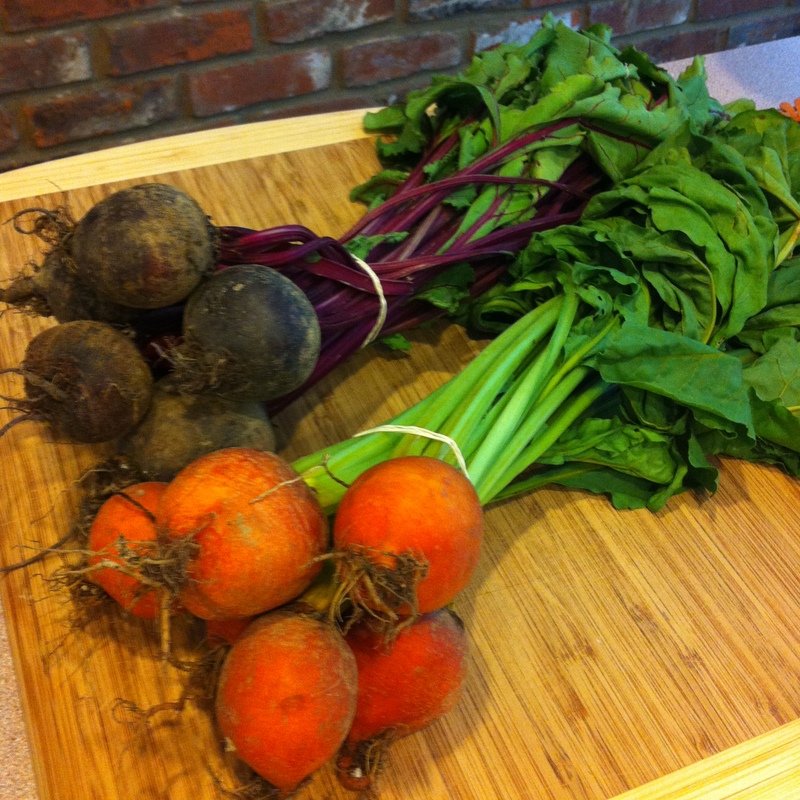 I visited 3 of my favorite blogs before I found someone who had actually cooked beets. Really? Thank goodness Angela from Oh She Glows is brave enough to tackle beets. She admitted to needing a conversion, too. But for those of us who brave the beets, we are well rewarded. So healthy, delicious, and colorful. These beets were found at our local farmers’ market, which means they are fresh and responsibly produced, which only increases my chances of a great outcome! 1. Roast your beets. Preheat the oven to 425 degrees. Trim off the beet greens (and save for another recipe) and the trailing root off the bottom. Wash thoroughly and place on large pieces of foil, one piece for the red and one piece for the golden beets to maintain their colors. 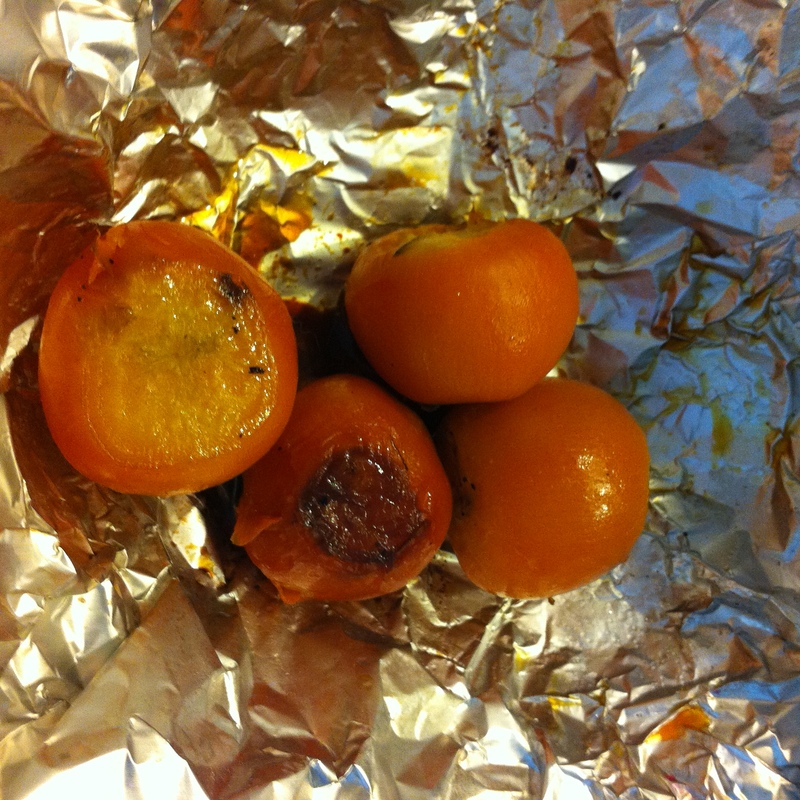 Drizzle the beets with olive oil, wrap up the foil and roast in the oven on a baking sheet. Roast for at least 45 minutes for smaller beets and up to 75 minutes for larger dishes. You’ll know they are done when you can easily pierce the beets with a fork. Roast the red onion in the same way, with olive oil and wrapped in foil. 2. 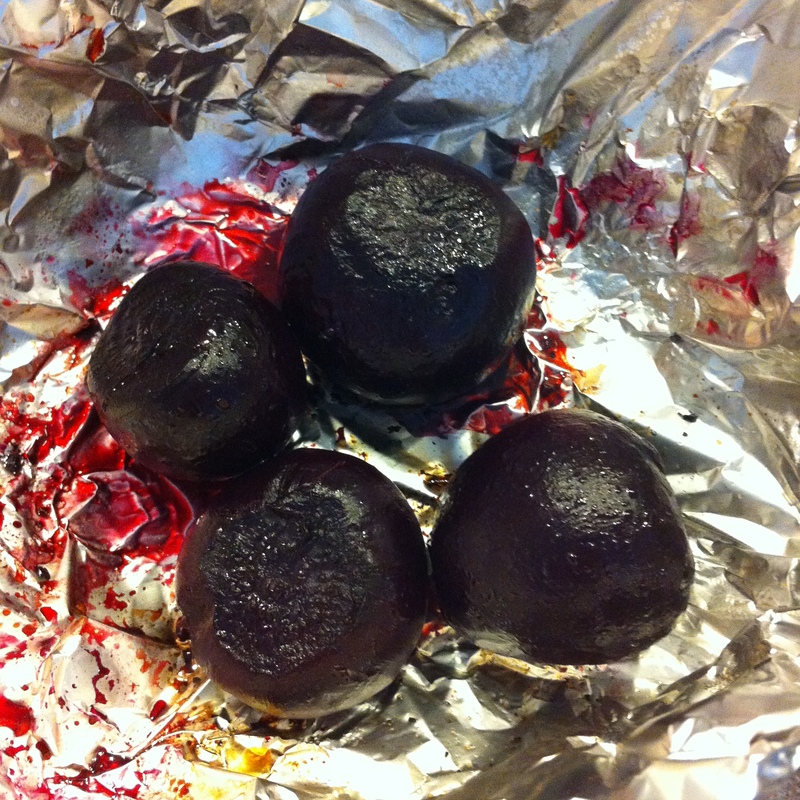 When they beets are done, carefully open the foil packets and allow them to cool. Once they are cool, use your hands to peel the beets. The skin should come off easily with just a few rubs. Yes, your hands might get a little stained. It’ll be worth it. Cut the beets into wedges or slices as you prefer. 3. While the beets cook, prepare the rest of the salad ingredients and dressing. Slice up the roasted red onion. Peel and section your clementines. 4. Prepare the dressing using a mini food processor if you have one. Blend all the dressing ingredients and adjust the seasonings to your preference. 5. Put it all together! Layer two plates with greens, clementines, beets, bleu cheese, pecans, and the dressing. Previous Post Previous post: I’ve got some ‘splaining to do!